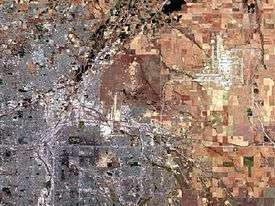 The City and County of Denver, Colorado, is located at 39°43'35" North, 104°57'56" West (39.726287, −104.965486) in the Colorado Front Range region. The Southern Rocky Mountains lie to the west of Denver and the High Plains lie to the east. According to the United States Census Bureau, the city has a total area of 401.3 km² (154.9 mi²). 397.2 km² (153.4 mi²) of it is land and 4.1 km² (1.6 mi²) of it is water. The total area is 1.03% water. Denver features a semi-arid climate (Koppen climate classification BSk) with very low humidity and around 3,100 hours of sunshine per year. The weather of the city and surrounding area is influenced by the proximity of the Rocky Mountains to the west. The climate, while generally mild compared to the mountains to the west and the plains further east, can be moderately unpredictable. Measurable amounts of snow have fallen in Denver as late as Memorial Day and as early as Labor Day, though this is extremely rare and hasn't occurred in many years. The average temperature in Denver is 50.4 °F (10.2 °C), and the average yearly precipitation is 14.30 in (363 mm). The average window for measurable (≥0.1 in or 0.25 cm) snowfall is October 17 thru April 27, averaging 53.8 in (136.7 cm) of seasonal accumulation for 1981−2010. Denver averages 270 clear and partly cloudy days per year or 3200 hours of sunshine making it one of the sunniest major cities. Denver's winters are normally dry and range from mild to considerably cold, and although large amounts of snow can fall on the mountains just west of the city, the effects of orographic lift dry out the air passing over the Front Range shadowing the city from precipitation for much of the season. Additionally, warm chinook winds can occasionally be felt as air passing over the mountains heats as it descends, bringing a melting snow cover and surging temperatures; from December to February there is an average 12−18 days of 50 °F (10 °C)+ highs and 1−3 days of above-freezing lows per month. The coldest temperature ever recorded in Denver was recorded on January 9, 1875 at −29 °F (−34 °C), though the last time Denver recorded a temperature below −20 °F (−29 °C) was December 22, 1990. Spring brings with it significant changes as Denver can be affected by air masses on all sides, whether arctic air from the north, which occasionally combines with Pacific storm fronts bringing snow to the city. In fact, as reported at Denver International, March is the second snowiest month, averaging 10.7 inches (27.2 cm) of snow. Additionally, warm air from the Gulf of Mexico can bring the first thunderstorms of the season, and continental warm air can bring summer-like warm and dry conditions. The last freeze of the season on average falls on May 6. The Front Range as seen from Westlands Park in Greenwood Village. Starting in mid-July, the monsoon brings tropical moisture into the city and with it come occasional short late-afternoon thunderstorms. However, despite this tropical moisture, humidity levels during the day generally remain very low, and lows rarely remain at or above 70 °F (21 °C). There are 38 days of 90 °F (32 °C)+ highs per year, though 100 °F (38 °C)+ highs are not seen annually. The average window for temperatures reaching the former threshold is June 4 thru September 7. In the autumn, the tropical monsoon flow dies down and as arctic air begins to approach it can combine with moisture from the Pacific Northwest to bring snowfall to the city – November is Denver's third snowiest month, and both the greatest snowfall from a single storm and daily snow depth on record occurred before the Winter Solstice. In general diurnal temperature range is large, averaging between 26.7 and 30.5 °F (14.8 and 16.9 °C). All-time record high: 105 °F (41 °C) on August 8, 1878, July 20, 2005, and June 25−26, 2012. Highest 24-hour precipitation: 6.50 in (165.1 mm) on May 22, 1876. Lowest monthly precipitation: none during December 1881; trace monthly precipitation has occurred several times, the last being November 1949. Highest one-storm total: 45.7 in (116.1 cm) from December 1−6, 1913. Denver has 79 neighborhoods that the City and community groups use for planning and administration. Although the City's delineation of the neighborhood boundaries is somewhat arbitrary, the City's definitions of its neighborhoods roughly correspond to those used by residents. Denver also has a number of neighborhoods not reflected in the City's administrative neighborhoods. Sometimes these neighborhoods reflect the way people in an area identify themselves; sometimes they reflect how others, such as real estate developers, have defined those areas. Among the neighborhoods commonly spoken of are historic and trendy LoDo (short for "Lower Downtown"), part of the City's Union Station neighborhood; Capitol Hill, Washington Park; Uptown, part of the North Capitol Hill neighborhood; Curtis Park, part of the Five Points neighborhood; Alamo Placita, the northern part of the Speer neighborhood; and the Golden Triangle, roughly the Civic Center neighborhood. Most of Denver has a straightforward street grid oriented to the four cardinal directions. Blocks are usually identified in hundreds from the median streets, identified as "0", which are Broadway (the west-east median) and Ellsworth Avenue (the north-south median). Colfax Avenue, the major east-west artery through Denver, is 15 blocks (1500 North) of the median. Avenues north of Ellsworth are numbered (with the exception of Colfax Avenue and a few others), while avenues south of Ellsworth are named. There is also an older downtown grid system that was designed to be parallel to the confluence of the South Platte River and Cherry Creek. Most of the streets downtown and in LoDo run northeast-southwest and northwest-southeast. This system has an unplanned benefit for snow removal; if the streets were in a normal N-S/E-W grid, only the N-S streets would get sun. With the grid pointed to the diagonal directions, the NW-SE streets get sun to melt snow in the morning and the NE-SW streets get it in the afternoon. The NW-SE streets are numbered, while the NE-SW streets are named. The named streets start at the intersection of Colfax Avenue and Broadway with the block-long Cheyenne Place. The numbered streets start underneath the Colfax and I-25 viaducts. There are 27 named and 44 numbered streets on this grid. There are also a few vestiges of the old grid system in the normal grid, such as Park Avenue, Morrison Road, and Speer Boulevard. Denver is primarily served by the interstate highways I-25 and I-70. The intersection of the two interstates is referred to locally as "the mousetrap." I-70 runs east-west from Utah to Baltimore, Maryland. I-25 runs north-south from the New Mexico border through Denver to Buffalo, Wyoming. I-225 traverses neighboring Aurora and connects with I-25 in the southeastern corner of Denver. Additionally, I-76 begins from I-70 just west of the city in Arvada. It intersects I-25 north of the city and runs northeast to Nebraska where it ends at I-80. U.S. Highway 6 connects downtown Denver to the suburb of Golden. A highway expansion and transit project, dubbed "T-REX", was recently completed along the I-25 corridor. The project included the addition of extra freeway lanes, the redesign of several highway overpasses, and a light rail line along the I-25 corridor between downtown Denver and the Denver Technological Center. The massive project was finished in Fall of 2006, ahead of schedule and under budget. Mass transportation throughout the Denver-Aurora metropolitan area is managed and coordinated by the Regional Transportation District (RTD). RTD currently operates more than 1,000 buses serving 10,000 bus stops in 38 municipal jurisdictions. 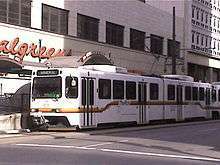 Additionally, RTD operates five light rail lines (the C Line, D Line, E Line, F Line and the H Line) serving 36 stations. Current RTD local fare is $2.25. FasTracks, an expansion project approved by voters in 2004, will allow light rail to serve cities such as Lakewood, Golden, and Aurora. Commuter rail lines will serve Boulder, Longmont and the Denver International Airport, augmenting existing light rail extending from the downtown area to C-470 servicing the Denver suburbs. Train service to Denver is provided by the Amtrak California Zephyr which runs from Chicago west through Denver to San Francisco. Additionally, there is the Ski Train provided by the Denver & Rio Grande Western Railroad which takes passengers between Denver and the Winter Park Ski Resort (operation suspended as of January 2009). Denver's early years as a major train hub of the west are still very visible today. Trains stop in Denver at historic Union Station, where travelers can meet up with RTD's 16th Street Free MallRide or use light rail to tour the city. 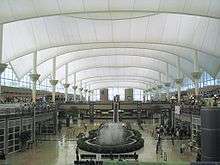 Denver International Airport, the eleventh busiest airport in the world, sixth in the U.S. In 2005 it handled 43.4 million passengers. In land area it is the largest airport in the United States, covering 53 sq. miles. 1 2 3 4 "NowData - NOAA Online Weather Data". National Oceanic and Atmospheric Administration. Retrieved 2013-01-08. ↑ "Station Name: CO DENVER-STAPLETON". National Oceanic and Atmospheric Administration. Retrieved 2014-03-13. ↑ "Threaded Climate Extremes for Denver Area, CO". National Weather Service. Retrieved 2012-02-10. ↑ "WMO Climate Normals for DENVER/STAPLETON INT'L AP CO 1961–1990". National Oceanic and Atmospheric Administration. Retrieved 2014-03-11.